There was a general belief that Nigerians are the happiest people on earth, in as much as that fact is arguable, I think we have carved a niche for ourselves by creating comic relief out of sweet or sour situations. From ‘accolades’ and ‘assurance’ to ‘transmission’, we have proven that we no dey carry last when it comes to comedy. Coming to the church, I remember a time when the church was a sacred place where people are only expected to worship the Lord in spirit and in truth (this has not changed relatively). However, for millennials, the truth is, the church is a place of warmth, welcome and worship, some even take it to the point of warfare which is acceptable to God- He is a man of war. Christians are expected to love the Lord but is it a sin to laugh out loud in the church? There are a lot of questions begging for answers in modern day Christianity; Should the pulpit be shared by pastors and performing artists? What role does entertainment play in evangelism? Is there a place for super talented ‘sinners’ to showcase their God given skills in the sanctuary? According to the Online Etimology dictionary, comedy is a narrative with a happy ending; any composition intended for amusement. Providing comic relief can earn you a pretty penny in our modern world, you don’t need to be an established standup comedian to make fortune and fame in this age of skits, selfies and Snapchat. From Steve Harvey and Kevin Hart to our very own Alibaba, AY, Helen Paul, Chigurl and Kenny Blaq, there are a plethora of comedians with their sauce and spices depending on what soothes your taste. Comedy is fast becoming a goldmine. I mean why is it that 3/4 of events in recent times are anchored by comedians. Why is laughter the hallmark of every event? Lest I forget, some comedians are Christians. Should we allow them to serve God with their talent? Comedy shows are always sold out irrespective of the exorbitant amount of money it takes to buy table-for-ten or a regular ticket. We are ready to pay any amount to get our ribs cracked. It is easy for a show to shut down anywhere in as much as there is a bait of comic relief, from corporate events to wedding ceremonies, AGMs, Award ceremonies, banquets, industry nights, political rallies and religious events. Will the church be left out in a world of ‘sold out’? It goes beyond comedy, bringing Jesus joy to the church through godly comic relief seems to have a place in evangelism. I have noticed that pastors sometimes spice up sermon with little comic relief to keep the attention of their congregation. A lot of people have argued that with the level of frustration and depression in Nigeria, a comedian can efficiently play the role of a doctor or a therapist – after all, laughter is the best medicine. For everything in high demand, there is always a corresponding high supply of it, not just to meet demand but to maximize the moment and make profit. I personally think that there is a difference between a comedian/compère and a complete jester. Not everyone who sings is a musician. Hence, it won’t be out of place to say that not all comedians are qualified to perform in the church. Jesters are professional fools or clowns employed to entertain. On the other hand, a comedian is a person with a good sense of humour who provides structured materials to entertain an audience by making them laugh. Making fun of sacred principles is a NO-NO for me. 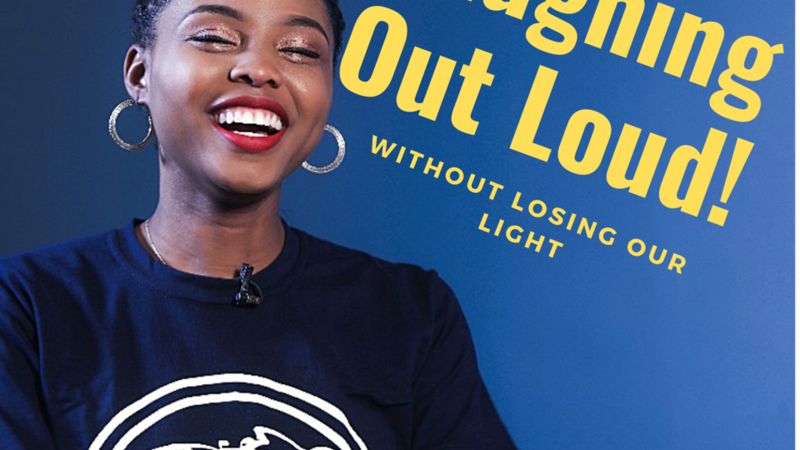 We shouldn’t lose our light just to laugh of loud. Christian comedy should not promote godlessness and lewdness. We should not displace grace just to give laughter a place in the church. Like any other lucrative venture, entertainment has a lot of poor and pathetic practitioners who are not in the game for passion but mainly for profit. The gospel music industry is a living proof that entertainment is at the core of evangelism in our modern world. We should create an enabling environment for Christian comedians to thrive and play their part in bringing souls to the kingdom. If Christians are willing to pay to get entertained by comedians in clubs or shows where ungodly principles can creep into their hearts. Why don’t we harness the power of comic relief to invite everyone to church to experience God in the beauty of holiness? If it is possible to sing our hearts out to the Lord in gospel hip hop, reggae and blues, we can also laugh out loud without losing our light.